Published on 4 April 2008. There is a scene in The West Wing, part way through Barlett’s campaign for a second term, when Toby Zeigler becomes aggravated by the constant appearance of banners demanding “Barlett for President”, insisting – rightly – that they should declare “Bartlett is President”. It’s an interesting vignette designed to demonstrate the assumed political truism that the incumbent of any given office automatically has an advantage over any pretender: A fact which is almost always true in politics. The incumbent should have an advantage, since people inevitably like to vote for something known over something unknown. Political parties all too often forget that people don’t vote on the basis of promises, but on the basis of actions: Telling people you’ll do all of what they want can never rival the power of actually doing some of what they want. On top of this, the incumbent has the advantage, by default, of being the more Presidential or Prime Ministerial figure – exactly the kind of figure one would want leading a nation, and hence the one most people are likely to vote for. People have great difficulty seeing past superficial appearances, as has been proved so many times in so many fields. Yet, at times of major political flux, the rules of the game inevitably change. The last such occasion was 1997, a seminal year in many spheres and hence unsurprisingly a seminal year in the political world as well. People had become tired of a government which itself had become tired, and of a Prime Minister who really had little more to do. Compare this with Tony Blair’s two election victories as Prime Minister. He was able to compare the state of the nation at the time of the election with the pre-1997 state of the nation, and make a convincing argument for improvement. He could cherry pick his greatest achievements and promised to build upon them. He had the incumbent’s advantage, and it served him well. Yet now, in 2008, Labour’s greatest achievements no longer resonate. We’ve tired of hearing of the New Deal, the minimum wage is old news, and NHS reform has been done to death. It seems like this government has nothing new to do – it’s done it all before, and we’re comparing Labour’s current promises with Labour’s previous delivery. The ‘bad old days’ of the Tories have slipped from the public conciousness, and it’s now very difficult for Gordon Brown to make a case for Labour’s successes without comparing to Labour’s previous failings. Indeed, even systemic failures of government – such as the recent furore over MP’s expenses – now enter the public conciousness as failings of Labour by default, as they are in government, even though they are often cross-party failings which should tar the Parliamentary machinery as a whole. Labour, as the party of government, gets all of the negative publicity, yet very little positive publicity for reform work since it appears that most of it is already underway. There are few earth-shattering initiatives left to announce, and the media quickly tire of reporting ongoing work. The fact is that David Cameron now has the advantage. He’s able to point out the failings of the Labour government without having to defend the failings of previous Conservative governments. In many ways, this moving forward of the agenda is his greatest achievement to date. David Cameron is now able to play the ‘one of us’ card which Tony Blair used so effectively in 1997. Cameron wants to show that he’s not part of the ‘establishment’. He listens to Morrissey, he thinks you should consider the whole man not just the political front, and any political faux pas merely plays in his favour. The recent coverage of him breaking cycle laws is a PR gift, likening him to almost anyone who’s ever ridden a bike rather than a nitpickingly law-abiding po-faced politician. Similarly, his refusal to answer questions about whether he’s taken cannabis merely leads much of the population to assume that he has – and hence identify with him further. 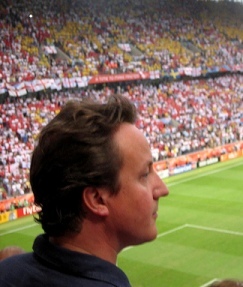 The well-oiled media machine around Cameron helps him to cultivate this image perfectly – anything which might be to it’s detriment is quickly swept under the carpet, whilst extensive comment and hence more extensive copy is given to ’embarrassments’, like the cycling incident, which actually improve his image. At present, David Cameron is playing a blinder, and the most incredible part of his strategy is that every jibe coming from attack-dog Labour only enhances his image – it comes across as the formed establishment trying to keep out the young incoming reformer. All-in-all, it’s difficult to see where Cameron can go wrong at this point. The only effective strategy Labour has is to expose him as a carefully managed establishment figure – but in so-doing, they can only expose themselves as the same, and probably end up harming their own campaign as a result. The results of the upcoming local elections will be fascinating. Whilst local elections rarely form an accurate reflection of the national game, it will be interesting to see if the Conservatives can make the gains necessary to solidify their position as the certain electoral leaders and gain yet more momentum going forward. Essentially, though, even if the Conservatives fail to make huge gains in these elections, it’s unlikely Labour will, and so the worst possible outcome is neutral. In essence, as far as I can see and unless something radically unexpected happens, there’s no way the next government can be Labour: Cameron is quickly cycling towards election victory. » Image Credit: Picture taken by Alison Ratcliffe, modified under licence. This 1,301st post was filed under: News and Comment, Politics.